One or more of the cards you chose to compare are not serviced in Spanish. You can only compare up to 4 cards. Please remove a card before adding another. You can only compare up to 3 cards. Please remove a card before adding another. You can only compare up to 2 cards. Please remove a card before adding another. 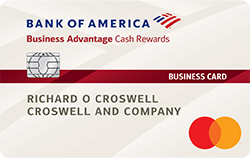 When you enroll in the Business Advantage Relationship Rewards program, you can earn an additional 25% - 75% rewards bonus on every purchase you make for eligible business credit cards. Plus, as a Business Advantage Relationship Rewards client, you’ll get benefits and rewards that grow as your business’ assets grow. 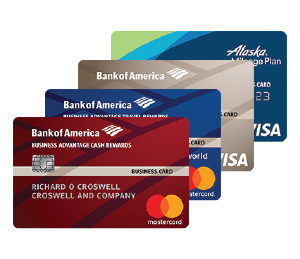 What should I look for when shopping for a small business credit card? What do I need to apply for a small business credit card? How many cards can I get for my company? When will I receive my card in the mail? Looking for opportunities to expand your business? Get information about term loans or lines of credit to finance your growth. Why use a small business credit card instead of a personal card? Separating your finances draws a distinct line between your business and your personal life and makes managing your cash flow easier. Getting a credit card for business use is one way to make that distinction. Small business credit cards are an easy way to start building credit for your business – so you have the credit when you’re ready to take your business to the next level. Easily download your company's transactions to QuickBooks. Give cards to your employees and set individual limits to maintain more control over your employees' spending. If you are looking for ease and convenience, small business credit cards are perfect for day-to-day purchases with the added perk of cash back rewards or travel rewards for most cards.